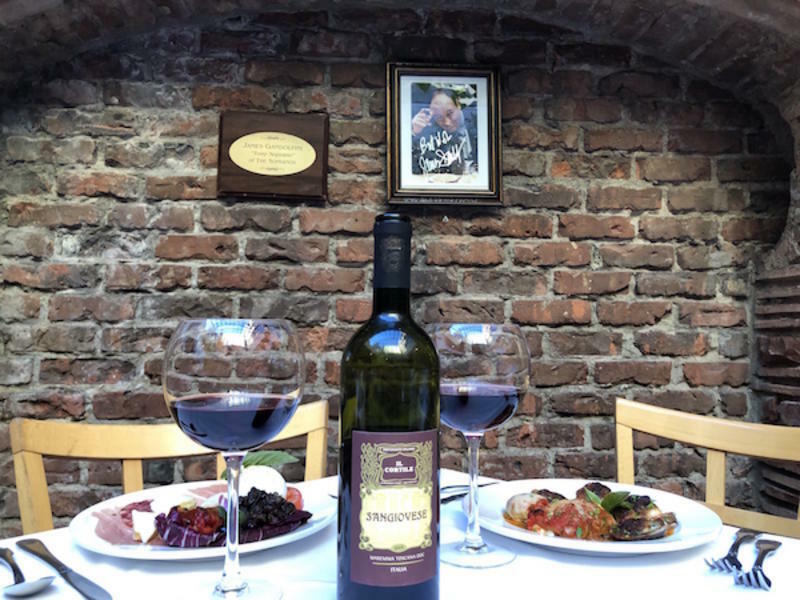 Il Cortile has been family owned and operated by the Esposito family in the same location since 1975. There are many reasons this establishment has thrived in the competitive environs of the NYC restaurant scene. First and foremost, the recipes presented here are always prepared with the very freshest and highest-quality ingredients available. The recipes are also family favorites that have been handed down for generations and are rich in Esposito family history. 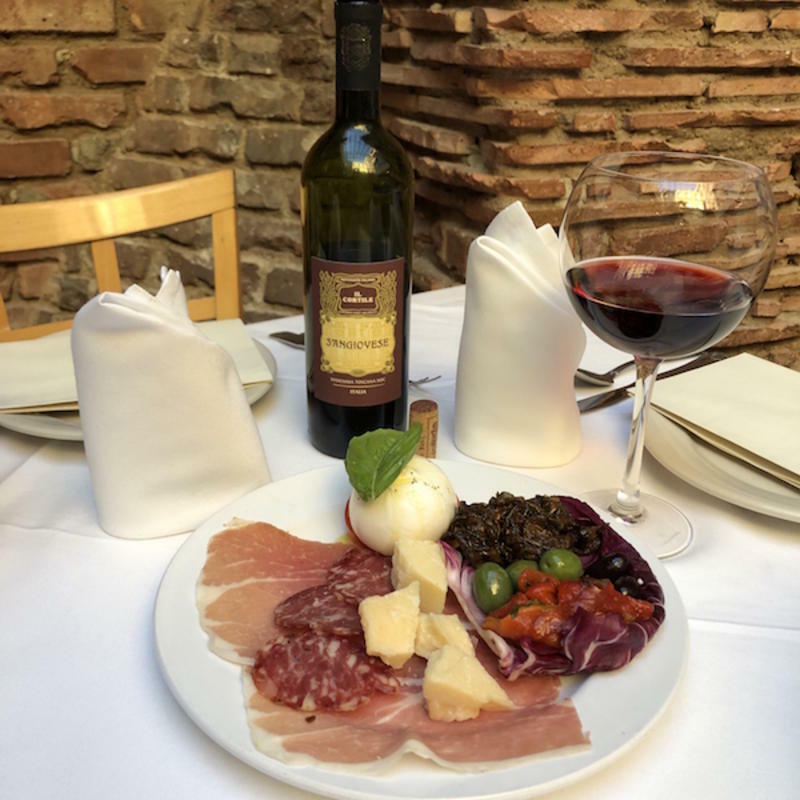 When you combine the exceptional and freshly-prepared food with a very loving and knowledgeable staff, in a warm and family-inspired atmosphere that's complete with your favorite Italian music, you’ve found the perfect spot for a most memorable meal! The menu at Il Cortile is extensive, but certainly not overwhelming. You’ll find a complete list of your favorite pastas, seafood, veal, chicken, pork and beef. There are also delicious vegetarian options, so always something to suit everyone in your party! 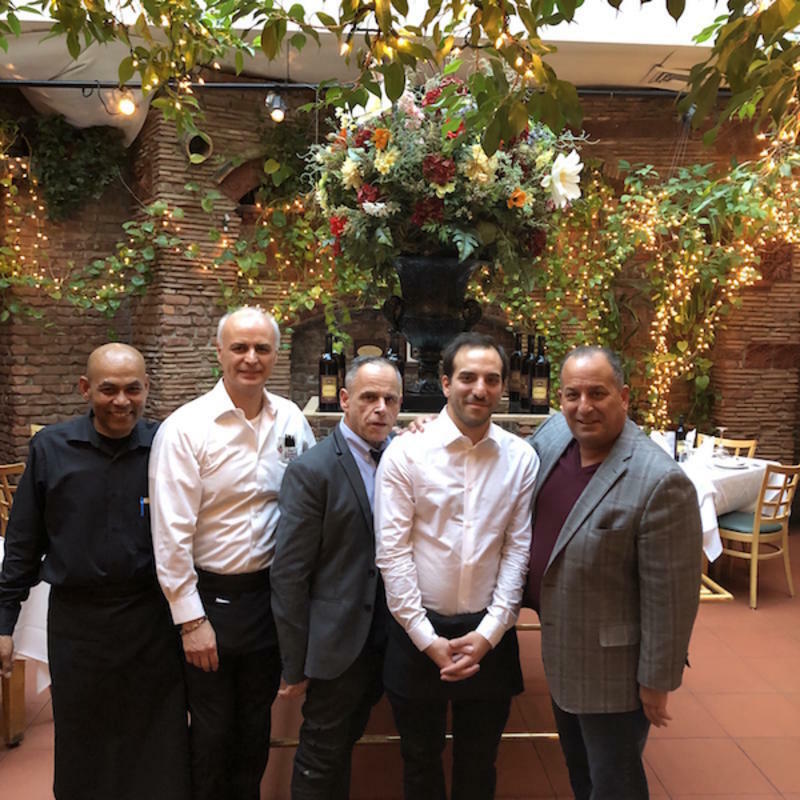 For fans of the hit TV Series, The Sopranos, you’ll be excited to know that Il Cortile was a favorite stop for many of the cast members, including James Gandolfini, Steven Van Zandt and Tony Sirico. 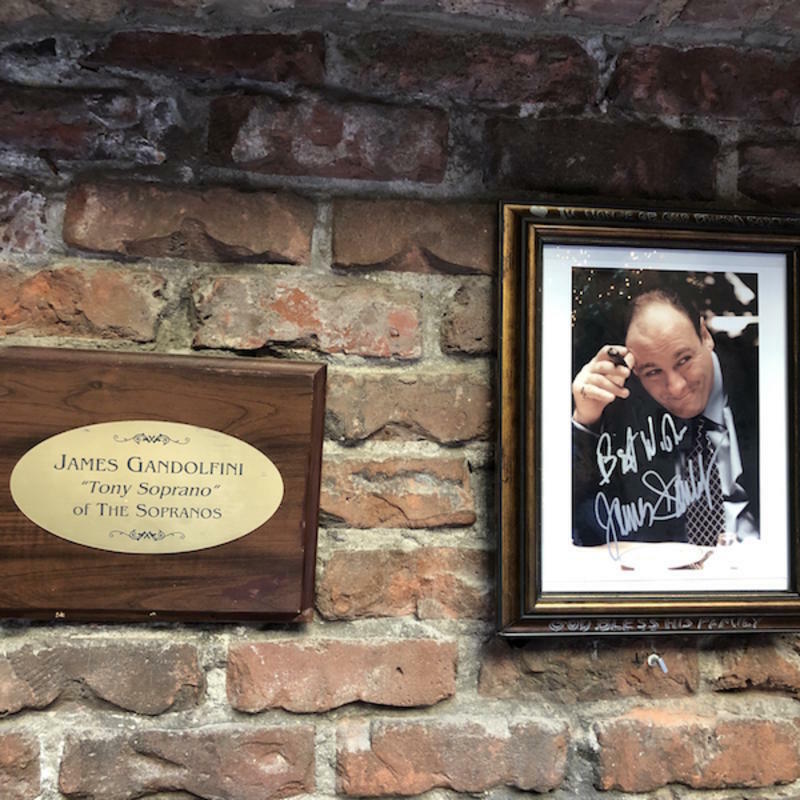 In fact, there's even a signed photo of James Gandolfini hanging above his favorite table in the rear of the Garden Room at Il Cortile. For our recent visit, we sampled several dishes and each one of them was both expertly prepared and served. Our waiter Angelo was extremely helpful in guiding us through the menu choices and he was also very adept at explaining the details about each of the dishes we ordered. For starters we sampled the Hot Antipasto Salad. The plate was piled high with Baked Clams Oreganate, Shrimp and Scallop Oreganate, an Asiago Stuffed Mushroom and Eggplant Rollatine. All were delicious! The Eggplant was stuffed with fresh ricotta and tomatoes, while the eggplant itself was crisp and cooked perfectly. Not soggy! The Scallop Oreganate was also cooked with a perfect crispy finish! Of course, we had to follow that up with a cold antipasti platter, which comes piled high with prosciutto, soppressata, grana padana, olives, roasted red peppers, marinated zucchini and special Parmesan cheese aged for 36 months. Everything on the plate was wonderful, and we especially liked the zucchini that was cooked with reduced balsamic vinegar. The aged Parmesan was also extra special and was a perfect complement to both the prosciutto and soppressata, or a treat on its own! Our server Angelo pointed out that, in Italian cooking, there is a systematic pairing of specific types of pastas and gravy (sauces) to create the best flavor combinations. Another essential element in Italian cooking is that the dishes are very colorful and - of course - quite tasty. The pasta at Il Cortile is all made in house! 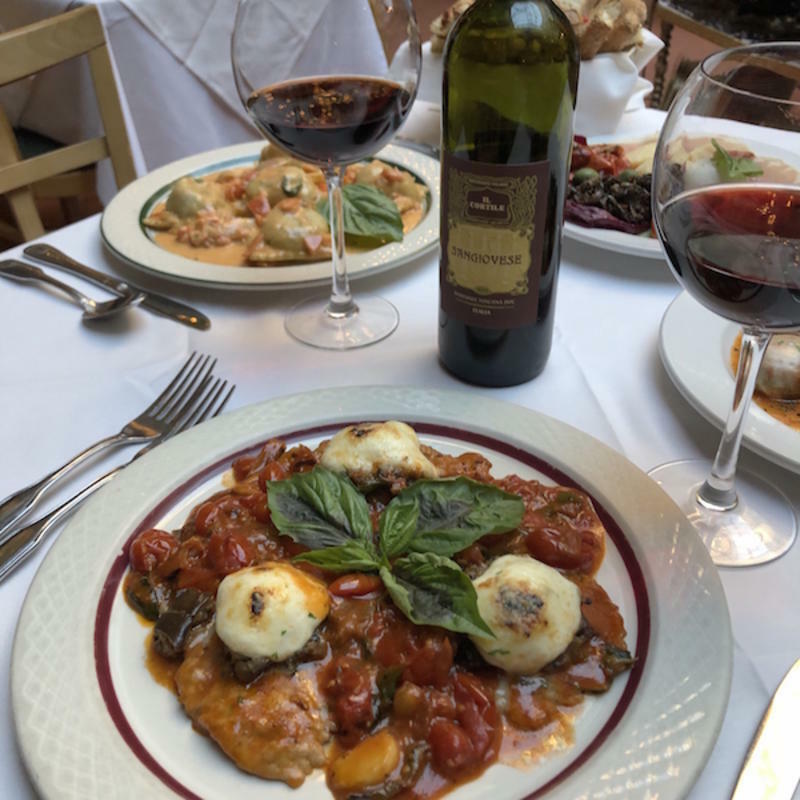 For entrees, we had two very special dishes; the Scaloppine con Melanzane, Mozzarella, Pomodori an Pepperoni Piccante, which translates to Veal Scaloppini with baked eggplant, fresh mozzarella, tomatoes and hot peppers. WOW! This knocked my socks off! A gorgeous plate and good to the last bite! A perfect plate of food! 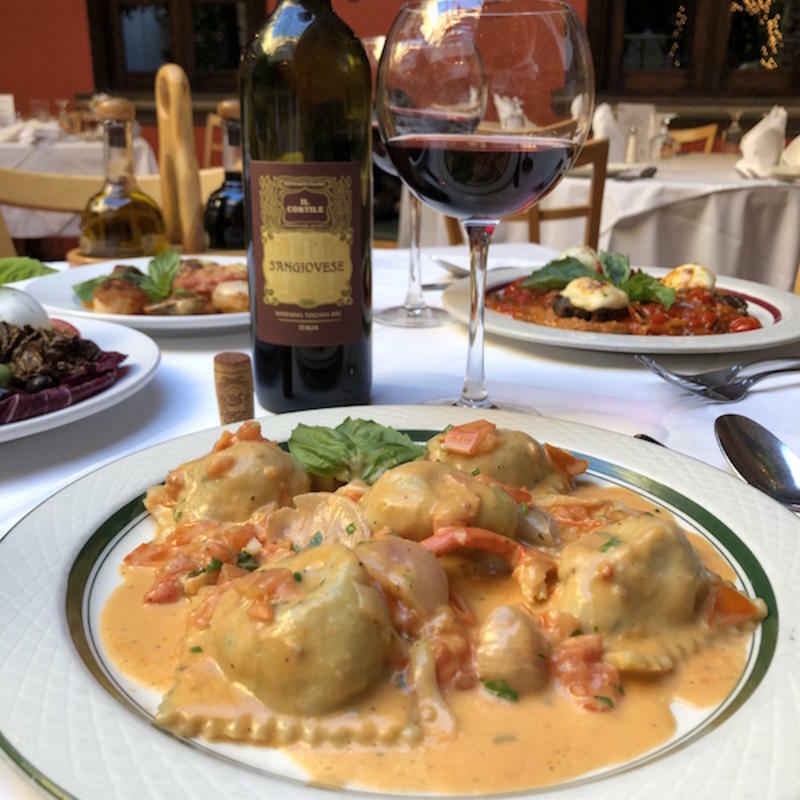 We also tried the Lobster Ravioli, which is a special menu item that is only available according to market availability, and this was our lucky day! This is a dish that you simply MUST experience. The plump Ravioli were full of perfectly-cooked lobster and covered with a cognac cream sauce with diced tomatoes. This was a plate of food you never wanted to end. Simply unbelievable! Another entrée at Il Cortile that will surprise you every time is the Broiled Pork Chop with garlic, oil and hot peppers. The pork chop here is as good or better than many of Manhattan’s most famous steakhouses. I’ve found it to be cooked perfectly every time, and the chop is always tender and juicy. Highly recommended! Dining At Il Cortile in NYC Is Exceptional From Start To Finish! 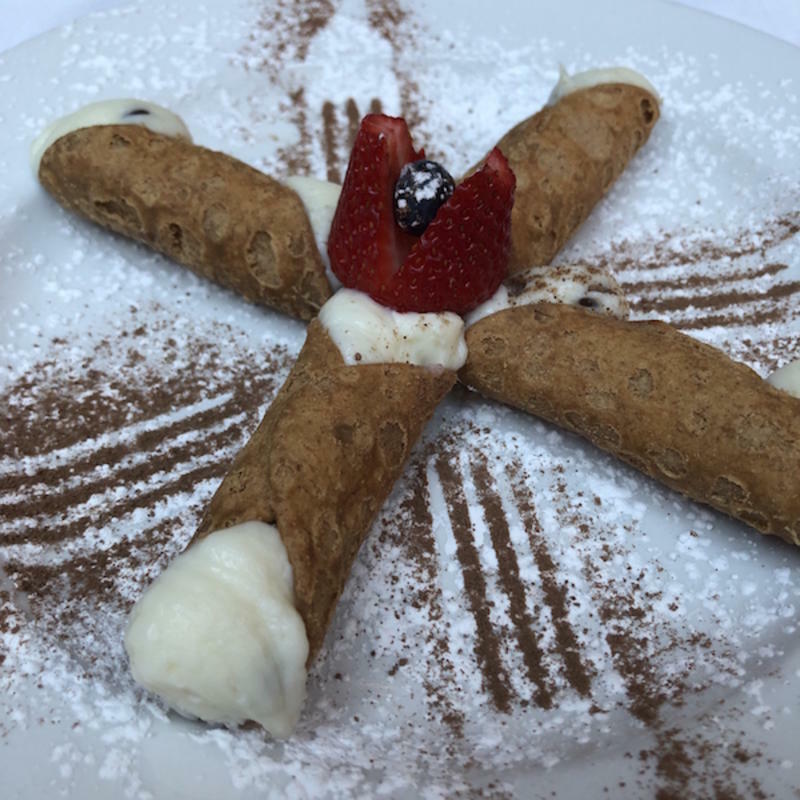 For dessert, we had the small cannolis, which were fabulous as expected. We also enjoyed a fruit parfait with Zabaglione cream that is made with egg yolk and Marsala wine. The parfait was freshly made, flavorful and full of color. The whipped ceam was fresh-made in house as well! A very nice finish to the meal. We had the traditional Limoncello and Espresso to end this exceptional dining experience and both delivered as expected. The Espresso came with a lemon wedge and I learned something else about Italian dining… The lemon is a headache cure! Il Cortile is an essential New York dining destination and the authenticity here is undeniable. 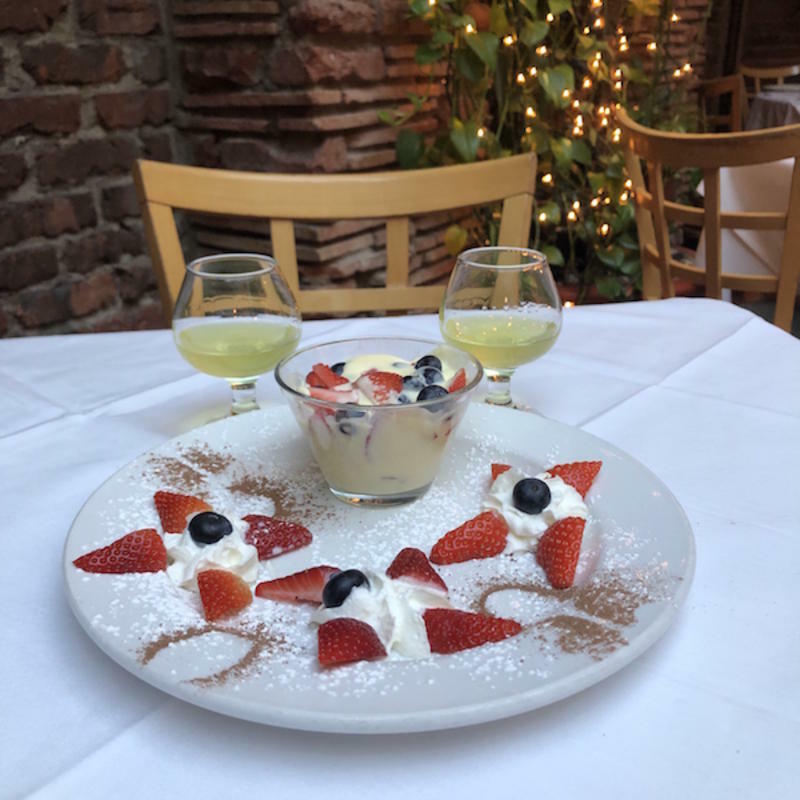 As a veteran of many meals at Il Cortile, I can promise that you have not dined in Little Italy until you have been to Il Cortile! Buon Appetito indeed!